“I knew when Dylan was three-years-old that he was artistic,” says his mother, Sandy Pierce. “I didn’t know that he would be doing what he’s doing now, but he definitely showed signs.” Dylan Scott Pierce could be your average teen with a love for basketball, rollerblading, reading and mountain biking, but that’s where the typical teen stuff ends. Dylan is also an art prodigy. A self-taught painter, Dylan was showing artistic potential when he was a child. His mom remembers having drawing contests with Dylan. “By the age of nine, he beat me and I started tearing mine up and throwing them away,” she says. Today, the seventeen-year-old’s talent garners rave reviews and art aficionados pay up to $20,000 for one of his original watercolour paintings. Around the time he was nine years old, Dylan began to sell his first sketches –portraits of people at the shopping mall or the grocery store. “While I was trying on clothes, Dylan would sketch pictures for people in the store with his pencil and pad. He took them everywhere we went,” Sandy says. That year Dylan also won first prize at an art festival in Atlanta, Georgia, where the family lived at the time. They have since moved to Destin, Florida. By the age of ten Dylan decided to specialize in wildlife art. “I’ve always loved animals. They are unbelievably interesting to paint because they have so much personality. As I observe them, I believe I can almost see what they’re thinking,” he says. Dylan began to photograph animals at zoos. 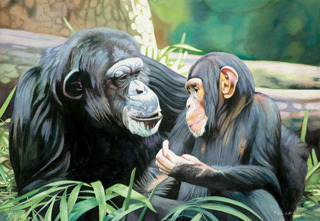 He would paint the animals by looking back at his pictures and journal notes. As he began to make a name for himself as a painter, the curators at zoos across the United States often gave him special permission to go behind the scenes so he could study the animals up close. These days Dylan has given up zoos and moved on to the real thing. 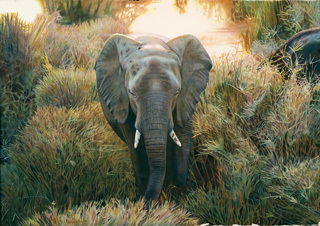 He went on his first African safari last fall in Kruger National Park, a wildlife refuge in South Africa. For a month, Dylan traveled through the grassy plains to study and photograph giraffe, impala, waterbuck, dwarf mongoose, white rhino and wildebeest. He returned to Africa again this winter to travel for five weeks through Zambia, Namibia, Botswana and South Africa. 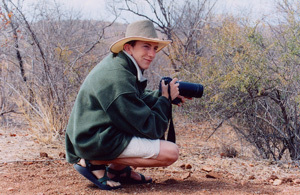 “I believe my work has improved after visiting Africa and observing the wildlife and landscape with my own eyes. I think I better understand the animals and the African people and I feel moved to help them. I am looking forward to learning more and being able to give back to them for what they have given me,” he says. To help the animals that he has learned so much about through his art, Dylan established the Dylan Scott Pierce Foundation in January. 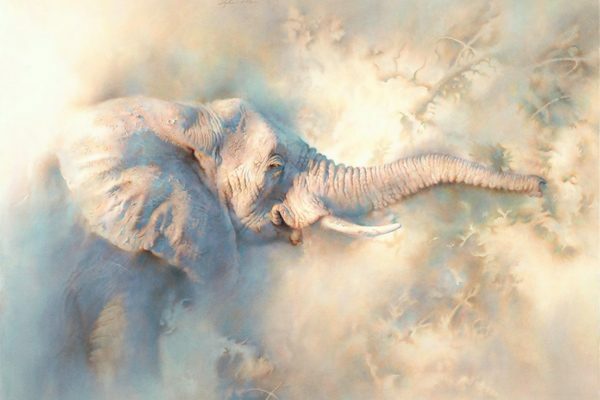 The foundation ensures that a portion of all proceeds from the sale of his licensed images on household items such as coffee mugs and bamboo curtains will go towards wildlife conservation and preservation. His first donations this year went to the National Wildlife Federation and the Lewa Conservancy of Kenya. 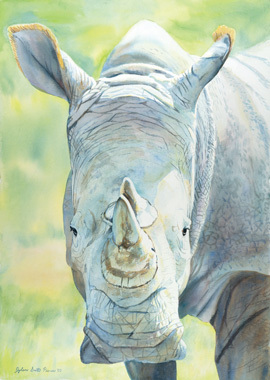 “Her Majesty” – This was the first painting Dylan created after his first African Safari at Kruger National Park. It shows the pride with which the animals carry themselves in the wild compared to those he had previously seen in zoos. “Stoic Standoff” – Dylan created “Stoic Standoff” in only two days when he was twelve. He actually finished the painting during a long car ride in the back of his mother’s van.